HQ Hostel Bangkok is a boutique budget accommodation for backpackers and budget travelers ideally located in the middle of Bangkok's city center, Silom road, within a walking distance to all major attractions, and a super transport network. Welcome to HQ hostel Bangkok, ... more than a hostel. HQ Hostel, Tte near-all location offers attractions ranged from mega-shopping centers, vast green and lake area, to world's renowned red-light district. 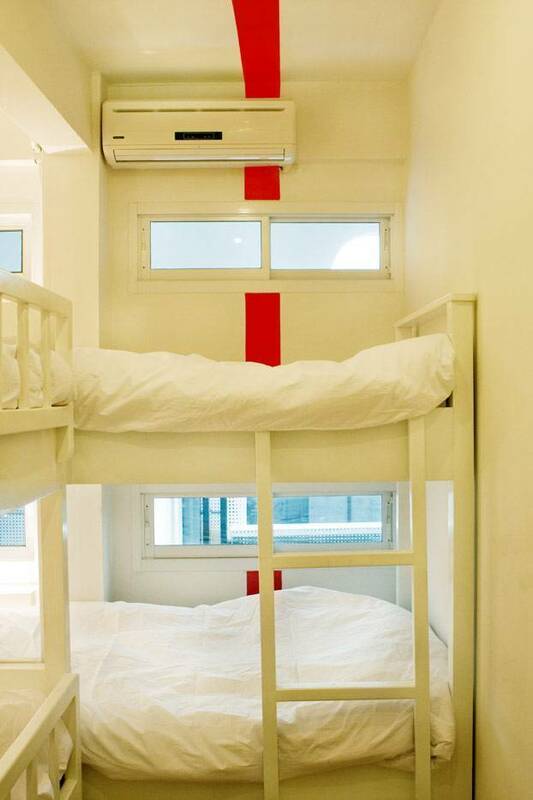 Conveniently situated near 2 skytrain stations, and offered friendly and English-fluent staffs, HQ Hostel is an ideal destination for those who seek a unique living experience in Bangkok. While staying with us, you can enjoy drinking variety of beers, playing pool or watching sports, new-released movies and other entertainment programs at our get-together area. High-speed internet is also available for those who wish to connect to your family or catch up with the world's events. Books and magazines of choices are offered at complimentary at our library corner. And for those who prefer exotic nightlife, Patpong, Bangkok's famous red-light district is only steps away. Room type : A Type Number of bed in a room : 10 Bunk beds dorm All for one and one for all. Group hugs, team activity, or new alliance can be happened in this room. A choice to stay with other hip friends from all over the world. Bathrooms are accessible from the hallways. Real bargaining price where you can't find better deal elsewhere!!! Room type : M Type Number of bed in a room : 4 Bunk beds dorm M is most important. Group of 4 or friend of two together. Share and stay in a cozy room with your buddy and another squad who love the same experience. It surely will be more than a roommate but a new beautiful journey. Room type : L Type Number of bed in a room : 6 Bunk beds dorm Sweeeeeet! Yeah, what do you want more? Stay with your friend or squad. More than a hostel, this is your room in the middle of the city. So you can enjoy your stay with your sweetheart and friends at the same time. HQ hostel is located in the heart of Bangkok and center of all available transportation systems. Within 20 meters from Silom Road in Soi Phiphat, next to Bangkok Bank head office and opposite Patpong area. Just steps from our hostel, you will find a huge variation of food and clubs that fits with your own desire. Thai-eastern food. Totally Thai style. -	In case of “cancellation”, 10 days before the date of arrival, no cancellation fee. 5 days before the date of arrival, 20% cancellation fee. -	In case of “No Show” or cancel within 5 days before the date of arrival, 50% of total agreed price will be charged of contract rate. Except high season is charged 80% of total agreed price. -	In case of “early check-out”, the guest must be responsible for 50% of the total unused reservation nights plus extra charge for one night. HQ hostel is located in the heart of Bangkok and center of all available transportation systems. Within 20 meters from Silom Road in Soi Phiphat, next to Bangkok Bank head office. Just steps from our hostel, you will find a huge variation of food and clubs that fits with your own desire.